What’s on my Bookshelf, Pt 1…& Fun Feet Give-a-way! Truly, I have been praising God for His supernatural favor even and especially in this trial. There have certainly been many little incidences where I can see His love and protection, even while the world would say I was at my worst…so, it’s all good. Cuz He’s ALL GOOD, amen?!? As a yoga teacher, I am constantly learning more about yoga via books. Sometimes the books are about a famous teacher’s method or style of yoga, sometimes they are about breathwork and meditation, sometimes they are about the lifestyle that goes with it (according to the author). As a registered yoga teacher with the Yoga Alliance, I actually HAVE to continue my education in this way (among others) to continue being registered, and I am actually quite thankful for that. I also always have a few yoga magazines partially read, waiting to be finished, laying around my nightstand. And there is usually something else educational or thought provoking—-not necessarily self-help, but something that teaches me more in depth on a subject. There are bibles all over my house, really, so I am just going to discuss the ones sitting on my nightstand shelves. Typically I have an NIV (New International Version) Bible, an Amplified Bible, and The Message Bible. The NIV, for those who don’t know, is probably the most commonly used “standard” version. It is not so formal or high language as the King James version, but it is also not necessarily a contemporary language version, either. Kind of right there smack in the middle of it all…So, I often look at it first, to read the Bible verses as I have heard them most of my life before I compare them to a different version. The Amplified Bible has been a favorite of mine for a long time. It has this wonderful way of expounding on the meanings that could be meant or conveyed for various words (based on the original Hebrew or Greek), so you can really get a thorough/deeper view of what is meant by what you are reading! For instance, typically if one were to recite to you a “regular” version of John 10:10, it would sound something like “I came that they might have life, and have it abundantly.” Ok, pretty cool. Thank You, Lord Jesus, because we are so grateful for that! I most often use the Message bible. I do use the other versions as well, but most often, my class scriptures are from The Message. Why? “I lived in two language worlds, the world of the Bible and the world of Today. I had always assumed they were the same world. But these people didn’t see it that way. So out of necessity I became a “translator” (although I wouldn’t have called it that then), daily standing on the border between two worlds, getting the language of the Bible that God uses to create and save us, heal and bless us, judge and rule over us, into the language of Today that we use to gossip and tell stories, give directions and do business, sing songs and talk to our children. And all the time those old biblical languages, those powerful and vivid Hebrew and Greek originals, kept working their way underground in my speech, giving energy and sharpness to words and phrases, expanding the imagination of the people with whom I was working to hear the language of the Bible in the language of Today and the language of Today in the language of the Bible.” He did that for 30 years with one congregation and was eventually asked to write a Bible that expressed what he had been sharing with them. I believe it was that quote which sent me rushing off to buy my own copy…imagine! The Bible written with language that expressed the emotion and passion behind the words, in a way that might make as much sense to me emotionally as reading a heartfelt letter from a friend or laughing at a joke someone tells! But it is nice to know that the Message version is not just some “watered-down” version of the Bible as I have heard some suggest who have not actually looked into it or know its origins. In fact, it is right on the money. The real meaning with the real passion. I do compare the verses of different bibles often…and, there are times when I like the NIV best or another version over the Message…I just leave that up to what the Spirit is revealing to me at that moment! Learning how to “take a real rest” and “the unforced rhythms of grace” certainly appeal to this driven, type-A personality, let me just tell you…. Now, I will tell you right now, my favorite version of that is still the Amplified…BUT, I do love the comparison of Real life and Eternal life…more and better than I have ever dreamed of??!?! Wowza. So, I basically cannot even begin to comprehend or imagine how amazing my life is intended to be according to my Lord’s standards…how cool is THAT?! 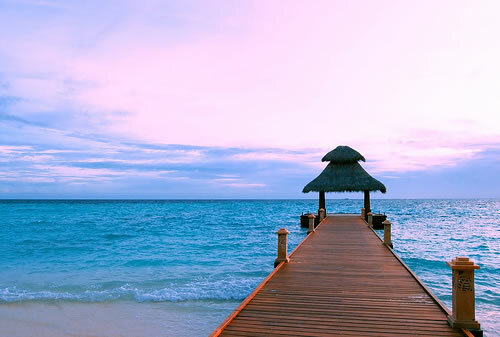 Both the life I am living here right now, and the future life in heaven…or both the natural life I am living practically, and my Spiritual life that is also happening right now in the heavenly realms…THAT is part of my inheritance in Christ…and all I need to do is believe and step into it! So…. Dear Lord, help us to give up our fears and anxieties and give ourselves fully to you. Finally, it’s time for our Fun Feet Give-a-way!!! 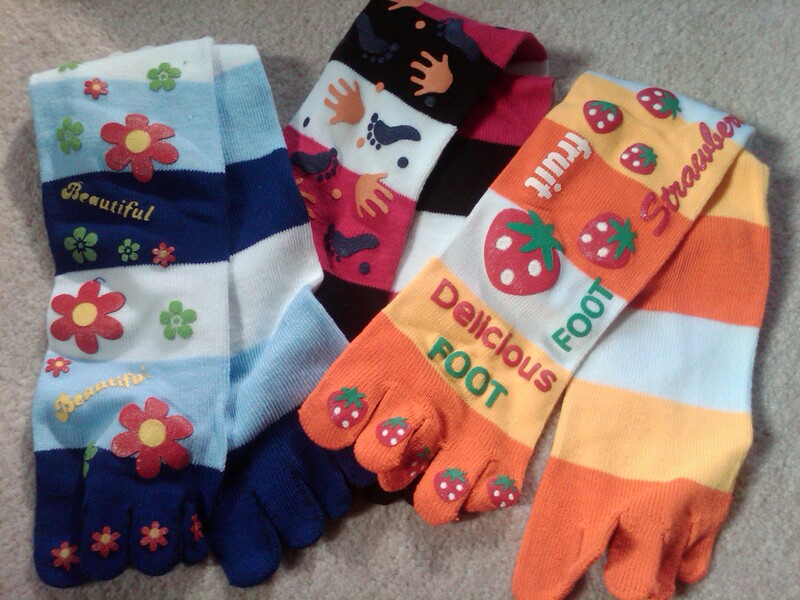 The winner of this week’s give-a-way will receive the adorable pair of crazy toe socks of their choosing (from the photo), which can even be used to do yoga! Comment below to enter; need an idea of what to say? Maybe you’d like to share what your favorite version of the Bible is…and/or perhaps include a favorite verse? Or would you like to share your reading style? (one book at a time, no distractions, or multiple books going off-and-on, or just magazines thank you much, or are-you-crazy-I-only-read-blogs, etc, etc…) And/or say where you would choose to wear your crazy toe socks if you win!!! Good Luck!!! I will draw a winner’s name from the bunch early next week! May God bless and keep you this week as you cast your fears and anxieties up to Him and lay back in His everlasting arms…. We have a Winner!….and some recipes!…and some inspiration!!! First things first, WE HAVE A WINNER!!! Believe it or not, the winner of this week’s give-a-way is…..
NOW, since Paula DID recently win, I am going to extend the give-a-way for the other 3 entrants…if ya’ll read through today’s blog post and comment accordingly, I will hold another drawing for any of the three of you who comment…I will give you until Monday night (the 3rd) to respond…and then you can choose between the 3 mists that are left (after Paula’s choice). Cool? This is just a little post this week since it is sign-up time for Vessels of Clay Yoga and there is a lot going on…So, here are two of my favorite recipes right now. One is really new to me, but I love it, and the other has come to me in the last few months, and the thought of it sends me straight to the fridge to get some greens! This recipe came to me from one of those Reader’s Digest Collections of stories books…yes, really. I was reading one of Patrick Taylor’s “Irish Country Doctor” series books, and the traditional recipe for Irish Soda bread was included as a bonus. (I love how Reader’s Digest does that.) Anyway, instead of regular wheat flour, I used a combination of Spelt and Rice Flour. Note: this recipe is wheat-free, not gluten-free. Spelt is a cousin of wheat that can often be tolerated by those of us with wheat sensitivities, but it is NOT gluten-free. Just fyi. 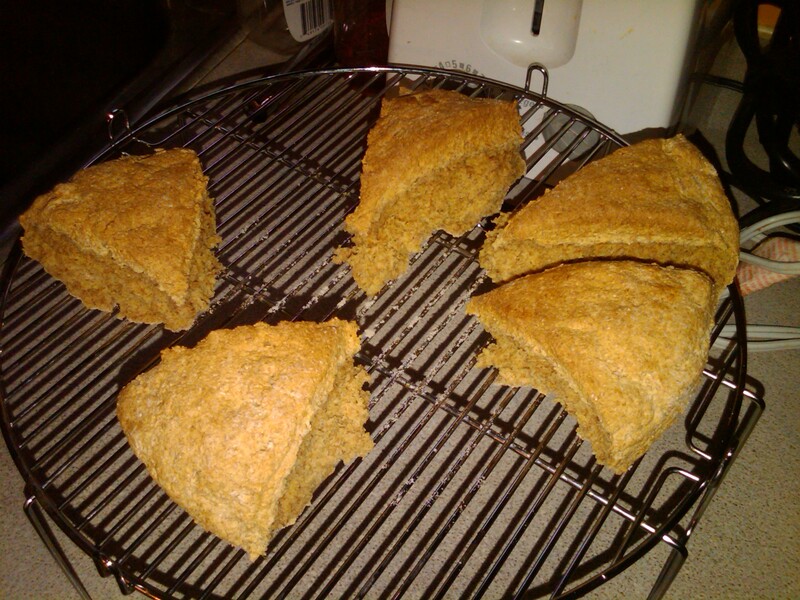 I used a small portion of rice flour to lighten it up, as Spelt flour can result in heavier bread. To make the traditional version, substitute whatever regular flour you like…but it might not be as healthy!!!! Oh, and yumminess? Total 10 out of 10 by me AND my hubby! Now, I cooked this in my NuWave Oven Pro on level 10, but here are the actual instructions for your regular oven. Preheat the oven to 400 degrees F. Grease and flour a baking sheet and set aside. Sift the flour, salt and baking soda together into a large mixing bowl. Then add enough buttermilk to make a soft, but not sticky, dough. Turn the dough out onto a well-floured board and shape it into a round cake about 1 1/2 inches thick. Transfer to the baking sheet; then, using a sharp knife, score the top of the dough into 4-6 wedges. Bake for 30-35 minutes. Cool on the baking sheet, then separate the wedges. 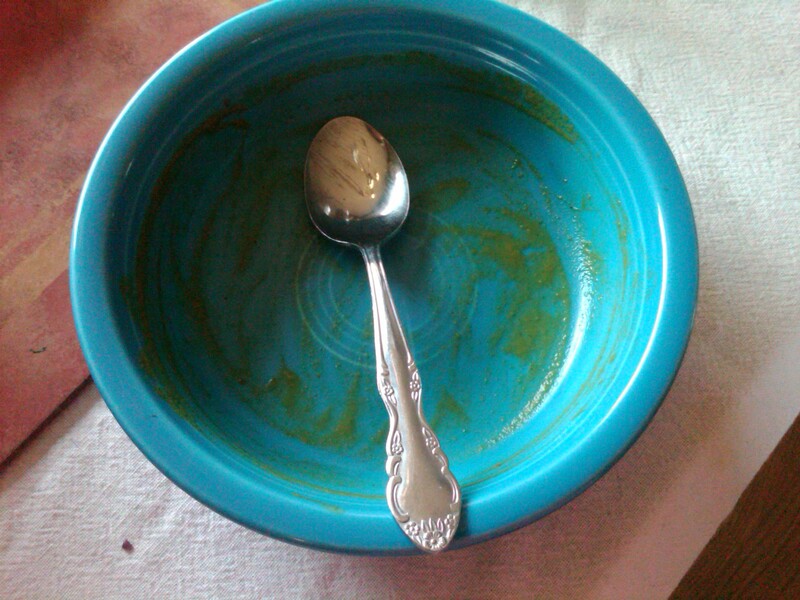 Like I said, it was super yummy. This may be a regular at our household from now on! This recipe comes as courtesy of the Vega website, Brendan Brazier’s company. If you are not familiar with him, he is the author of the Thrive Diet books, which are centered around how even triathlon athlete types like him can totally thrive on a plant-based diet! Google it; you will be glad you did. So, this dressing recipe is so totally yummy, that just remembering I have some made up/in the fridge makes me WANT to go make a salad. Yes, it’s that good. 16-17You realize, don’t you, that you are the temple of God, and God himself is present in you? No one will get by with vandalizing God’s temple, you can be sure of that. God’s temple is sacred—and you, remember, are the temple. As for everyone else, Have a great weekend, feel free to comment, and stay tuned for “What’s on My Bookshelf?” and another FUN give-a-way!!! 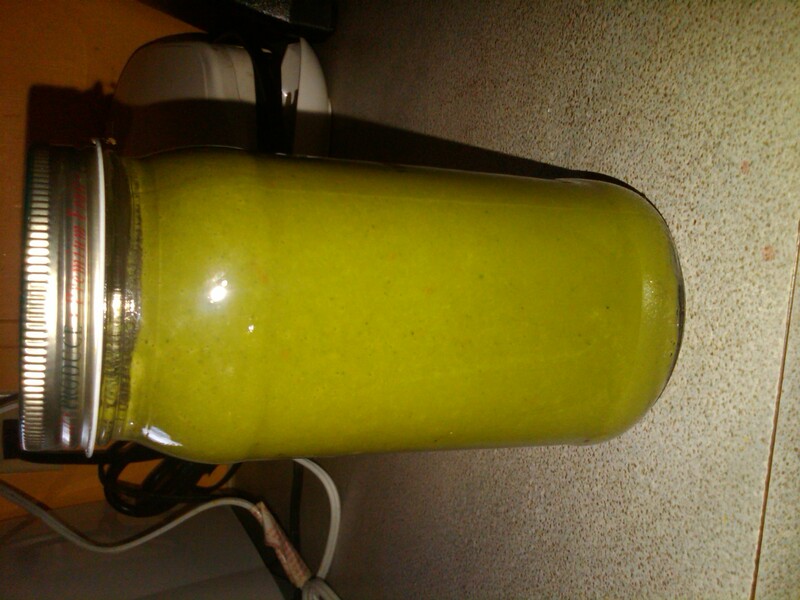 “Green” recipes, little tidbits, and a winner!!! Gonna share some “green” recipes today, whether in color or just use of produce or items, as well as throw in some little newsy bits and announce a give-a-way winner! A little while back when our garden was over-run with zucchini, I tried out this recipe from Hobby Farms magazine. It would be appropriate to make it again, as my basil plant is now flourishing!!! 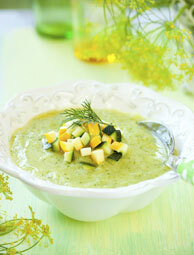 Puree zucchini, basil and other farm-fresh ingredients for a refreshing summer soup. Heat the olive oil in a large, thick-bottomed pot over medium-high heat. Sauté onions, garlic and salt until vegetables start to soften. 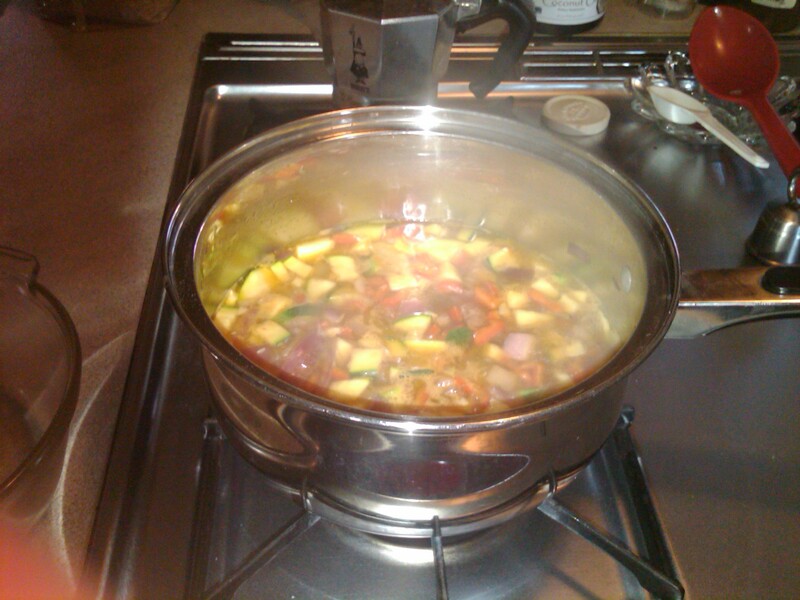 Stir in pepper, zucchini and stock. Bring to a simmer, and cook until pepper is soft, about 10 minutes. Stir in the spinach and basil just until wilted. Use an immersion blender to blend until smooth. Add more salt if needed. Serve hot, topped with chopped fresh tomatoes if desired. This soup is great for on-the-go, as well, whether hot or cold! 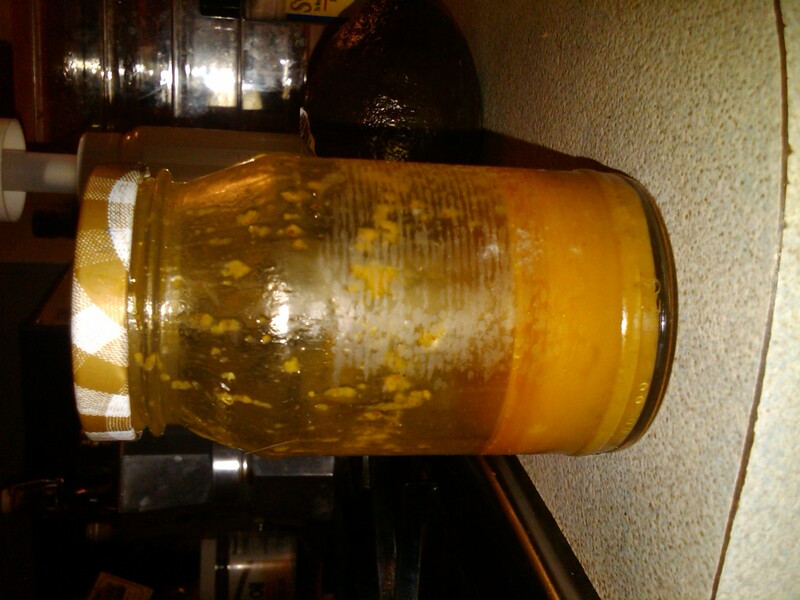 “Green” tip: store wet things like soup in clean jars in the refrigerator; good re-use of something rather spending energy on recycling or (gasp!) just throwing it away, and storing things in glass cuts down on your chemical toxin intake (some plastic storage containers have been known to leach unknown substances into your food, even when cold). Zucchini-basil soup stores well in a mason (or other) jar! Here is a recent DELICIOUS recipe I tried recently after watching an episode of “Giada at Home” on the Food Network. I tweaked it to make it healthier. For the cookies: Line a baking sheet with a silicone liner or parchment paper. Set aside. In a food processor, pulse together the butter, sugar, and lime zest until combined. Add the egg, lime juice, and vanilla. Process until smooth. Add the rice flour, cornmeal, baking powder, and salt. Process until the mixture forms a dough. Place the dough on a lightly floured surface and knead for 20 seconds. Form the dough into a ball, wrap in plastic, and refrigerate for 20 minutes. Place an oven rack in the center of the oven. Preheat the oven to 350 degrees F. Lightly flour a work surface. Cut the dough in half and roll out each piece into a 9-inch diameter circle, about 1/4-inch thick. Using a 3-inch round cookie cutter, cut the dough into 10 circles and arrange on the prepared baking sheet. Gather any scraps of dough, knead together, and roll out to 1/4-inch thick. Cut out 2 additional rounds of dough and place on the baking sheet. Bake until light golden around the edges, 15 to 20 minutes. Cool for 10 minutes and transfer to a cooling rack to cool completely, about 15 minutes. For the glaze: In a medium bowl, whisk together the powdered sugar, lime zest, and lemon juice until smooth. 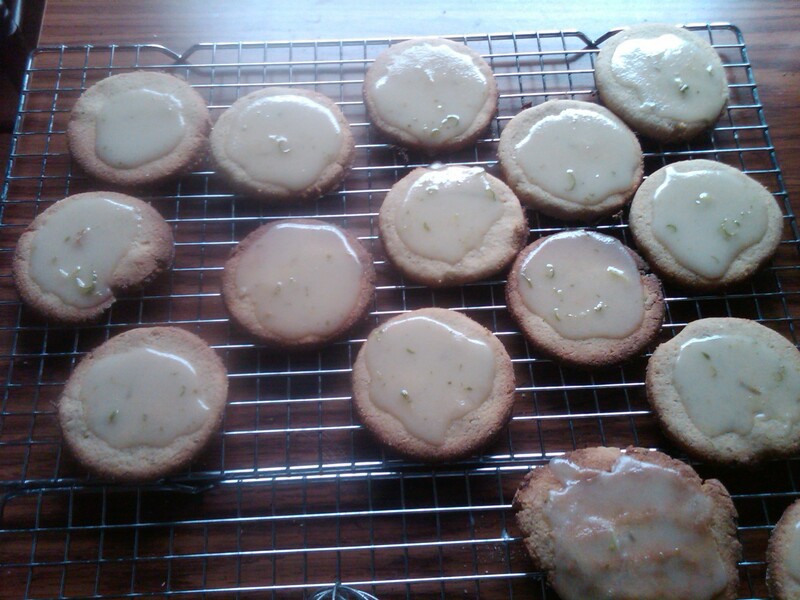 Spread about 1 teaspoon of the glaze onto each cookie leaving, a 1/4-inch border around the edge. Allow the glaze to harden for about 45 minutes before serving. Newsy Tidbits and other info….. If you have been reading this blog for awhile, you know that we have been “fostering” a plethora of felines on our compound, desperately seeking new homes for the sweet babies! Hallelujah, we found one!!! Thank you, very much, Paula, for opening your heart and home to one of the darlings! I am actually looking forward to tomorrow’s run! 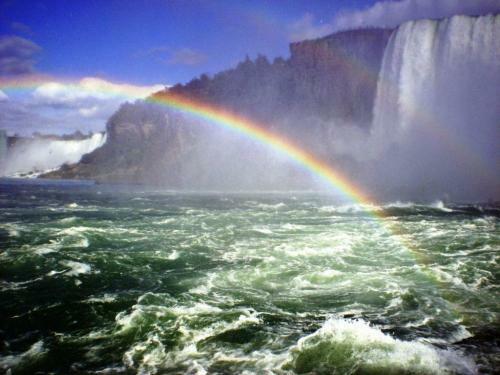 Psalm 145:9 (NIV) The Lord is good to all; he has compassion on all he has made. Isaiah 30:18 (The Message) But God’s not finished. He’s waiting around to be gracious to you. He’s gathering strength to show mercy to you. God takes the time to do everything right—everything. Those who wait around for him are the lucky ones. Speaking of waiting and how good things come to those who wait (is THAT where that phrase came from? ), some of you are waiting to find out who won this week’s give-a-way of either a yoga mat or a Vessels of Clay Yoga coffee/tea mug….and the winner is….. So, at your convenience, Paula, let me know which you would prefer: a yoga mat in either Buttercup Yellow or Dark Teal (check last week’s blog post for pictures) or a Vessels of Clay Yoga mug! And congratulations!!! Thank you to all of the participants! It sure is fun getting your answers here and on Facebook!!! Yoga Mat Etiquette, Trust, Submission, and a Winner! 2. 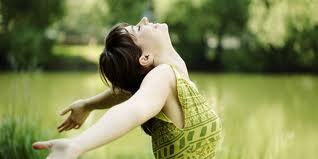 When walking through a yoga room, do not step on another person’s mat without first asking their permission. This is their “sacred” space where they take all of their intention, hard work, and let’s face it, sweaty foreheads. If a teacher comes by to make an adjustment, he or she will (hopefully) ask permission first if they have to step on your mat to make the adjustment. 3. When finished with your mat, you can wipe them off with “specially made” yoga towelettes, or Clorox wipes designed to kill viruses, etc. Is especially good when the mat you have used is not your own! 4. 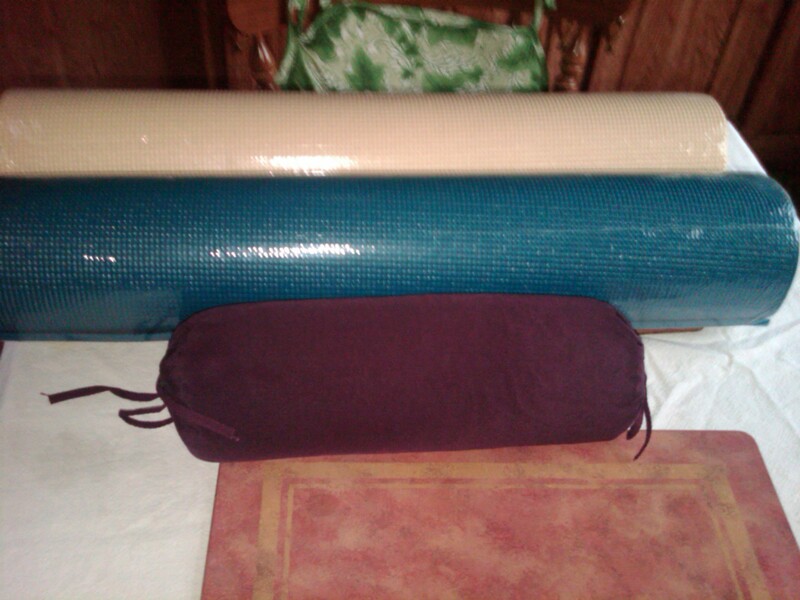 Folding of the yoga mat: especially if the yoga mat IS yours—fold the mat in half once, then roll mat up. This will ensure that the space where your own feet have been is enclosed, and the space which has been touching the floor (and all other things that have touched the floor) will not be rubbing against your mat where you have and will be touching your skin! 5. Yoga mats can be washed in the washing machine and dried in the dryer—to a certain degree. Use woolite or another extremely gentle cleaner designed for delicates. Wash on cold in delicate cycle no longer than 15 minutes. (My delicate cycle is only 6 minutes long, so I go for the extra rinse at the end.) For drying, dry on air fluff or very lowest heat setting for no longer than 15 minutes. Enjoy these little tips and have a wonderful practice! So my darling Veronica, let me know which you prefer: a teal yoga mat, a buttercup yoga mat, or an eggplant neckroll…and Congratulations! Have a STUPENDOUS weekend everyone! May God bless you richly!